"There are the happy hours that accompany us throughout our live ..."
Nice to welcome you on our site. Schönbühel is a little village 5 kilometers away from the world famous monastery Melk. In this place - surrounded by the mythical Dunkelsteiner-Wood and the Danube - the Wachau shows in their most original side. 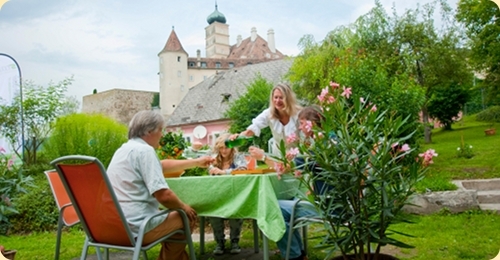 Our guest house is located opposite the fairy-tale castle Schönbühel. Nearby are the St. James path and the Danube cycle track. You can enjoy your holidays amidst an environment of magic and beauty. Experience unforgettable hours. CSS Template by Free CSS Templates.